The trend for contemporary Korean art is hitting the Middle East. Ana: Please Keep Your Eyes Closed for a Moment (until 2 January 2016) at the Maraya Art Centre in Sharjah is the first exhibition of contemporary Korean art at a public institution within the region. As well as introducing young Korean artists to the art scene in the Gulf, the exhibition looks at wider notions of identity. “I wanted to question what it means to be Korean or what Korean art is,” says JW Stella, the London- and Seoul-based curator of the show. “Contemporary art from Korea was (and still is) relatively unfamiliar to the Middle East, particularly in comparison to art from China or Japan.” The exhibition features works by 12 Korean artists and one from Saudi Arabia. 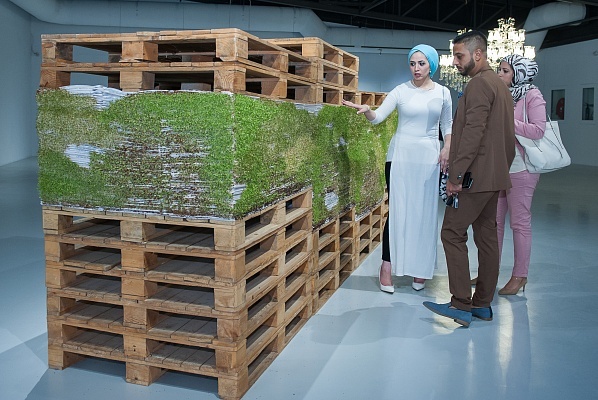 Standout works include a 15m-long mural by Gayoung Jun and an installation by Juyeon Kim comprised of 7,000 Emirati newspapers covered in sprouting seeds. Continue reading on The Art Newspaper.